The Cyclists Please Dismount signs that have just appeared are, at least, polite but the London Cycling Design Guide frowns on Cyclists Dismount signs. 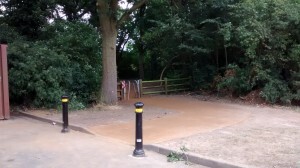 In this location it isn’t even desirable behaviour – a cyclist walking with a bike would fully block the route for some time. A sensible cyclist would ride up to the turn, stop ,wait for any walkers under the bridge, and when clear ride through quickly. There is already a pedestrian priority sign but maybe “Cyclists stop and look out for walkers” would be more explicit. A pity that unimaginative planers see “Cyclists Dismount” as the solution to all problems – strange that you never see “Drivers push your vehicles”. The use of bollards to mark the dropped kerb and keep it free from parking is something that Richmond could adapt in Ranelagh Rd where the access to Isleworth Prom is usually parked over. 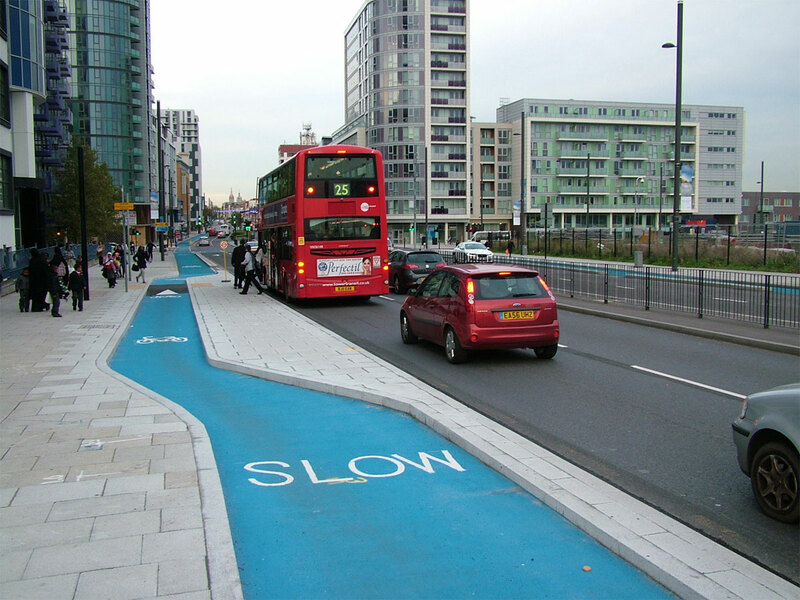 Kew Road cycle lane – show me the paint! 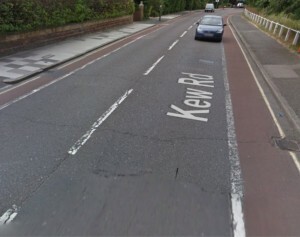 Kew Road is mostly a lousy place to cycle. 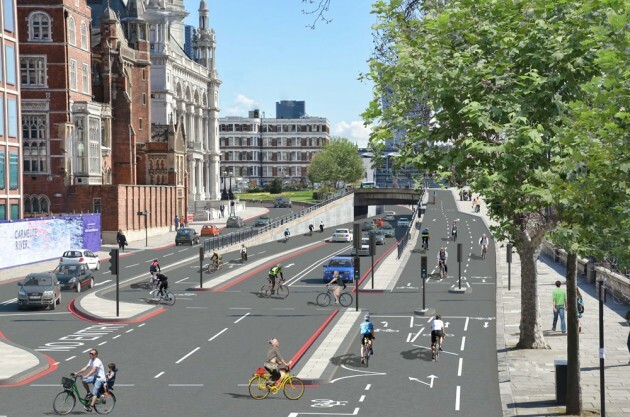 But until recently, it at least had mandatory cycle lanes along a large part of its length. 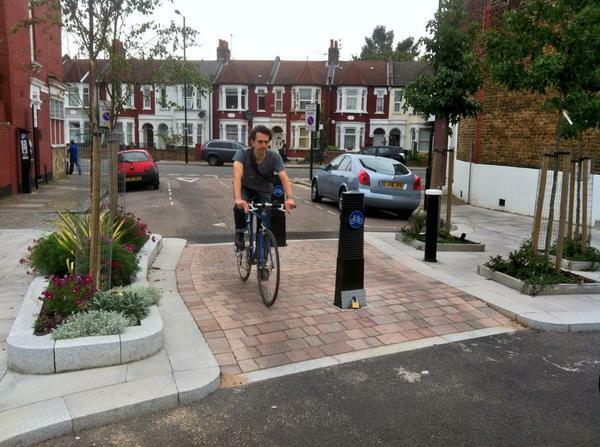 The cycle lanes used to look like this – not ideal, but probably the best observed cycle space in the borough. 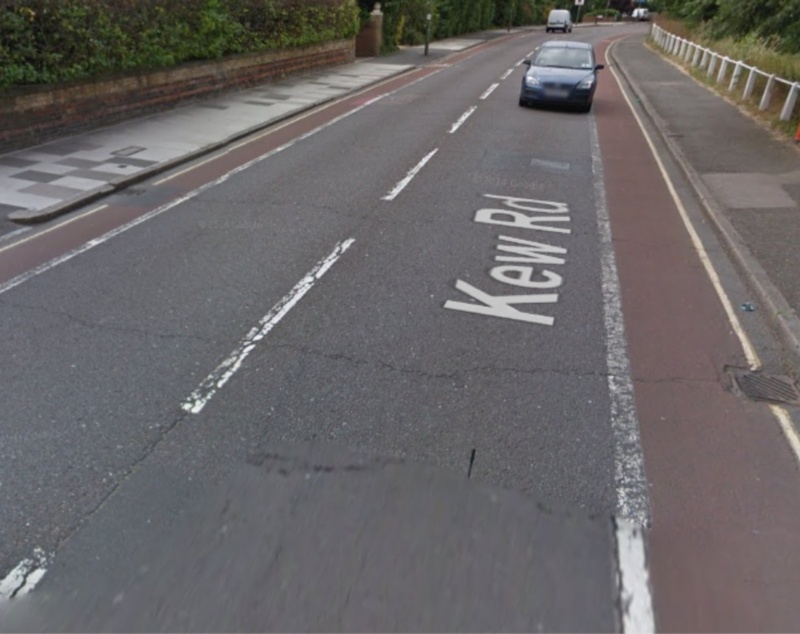 Given the volumes of traffic, and the potential for it to be an arterial route for people to cycle around the borough and from places like Kew Bridge, the road badly needs fixing. 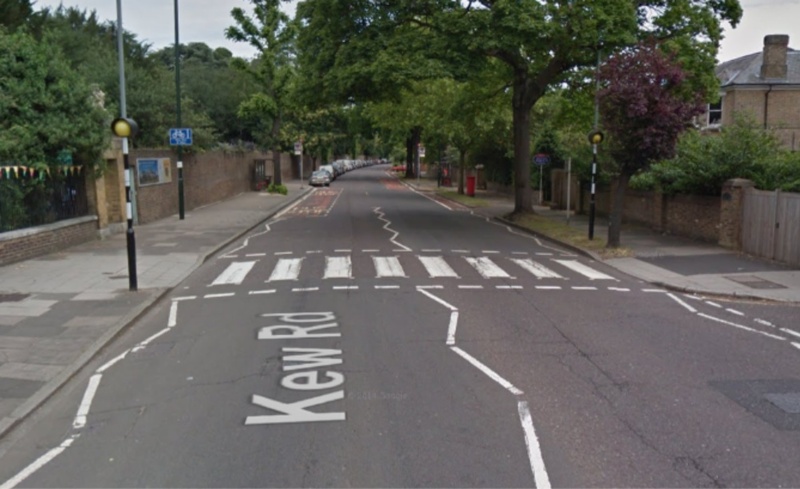 Recent changes have included over £100,000 spent on replacing a zebra crossing with a traffic-light controlled crossing, and resurfacing. 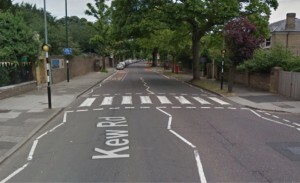 Most worrying about all these changes is that engineers told us there were concerns about speeding on Kew Road, and the new design of the crossing point above – which adds a pinch point – is expected to slow traffic. We don’t think it’s appropriate to plan to slow traffic by pushing cycling into the carriageway. Further, it’s hard to believe that resurfacing the road is actually going to do anything other than increase average speeds: so far, the it seems our borough engineers aren’t very on-board with TfL’s new interest in properly supporting cycling, or indeed with the new team. We’ve asked the council to at least re-instate the cycle lanes properly, and will update you as soon as we have a response. Wonder if you can help me? I am a cyclist using 316 to commute to and from work.Most of the times I use cycling lines but I find it very difficult to do that just after Richmond roundabout when the cycling line moves to the right side of the road, when cycling towards central London. The stretch between the two roundabouts has 10 junctions with extremely poor visibility for cyclists and drivers. I had had 3 accidents there in the past year and have witnessed at least 10 accidents. Since I cycle on the pavement on the left knowing that I commit an offence. What I find very frustrating is the fact that that in the widest and most cycle friendly part of that pavement where hardly ever there are as many pedestrians as on the other side of the road, the cycling is prohibited but in the narrower bit where there are shops and junctions the cyclist can share the pavement with pedestrians. Have you ever made any attempts to increase the cycling lane on both sides of 316 post Richmond roundabout? Can you also advise me who should I contact to express my views. 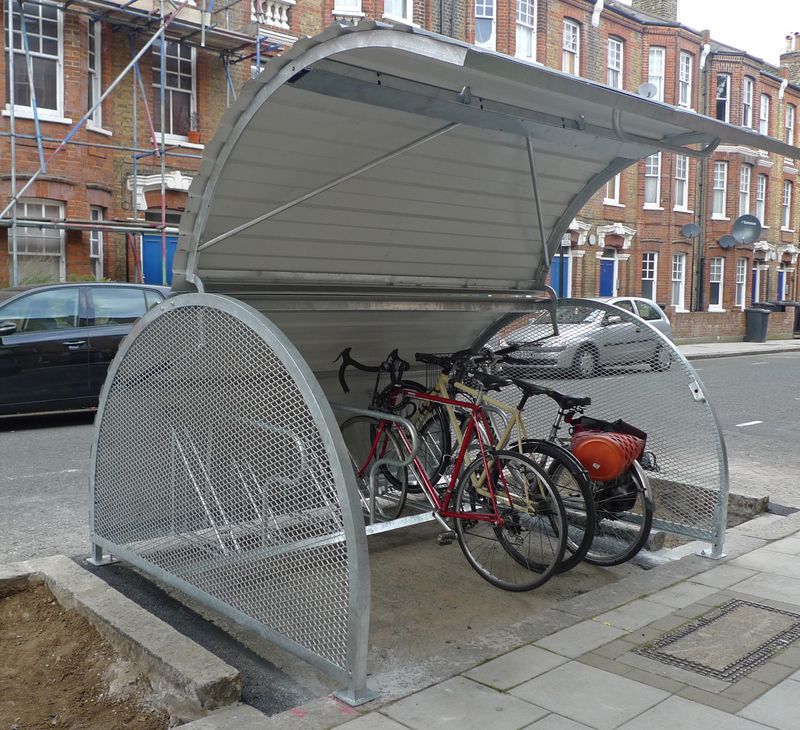 Also do you know when we will know if the Mini-Holland bid was successful? We’re aware of a number of issues with the A316, and we’ve endeavoured to highlight some of them on Cyclescape – see http://richmondlcc.cyclescape.org/tags/a316. Sadly, there’s nothing happening right now: it’s a feature which is very frustrating, because while it’s great to have a clearly built, off-road cycle lane along such a busy road, it’s rendered very annoying because of the choice to require cycling to give way to cars at every junction. As our correspondent writes, this makes it both feel unsafe, and be unsafe. 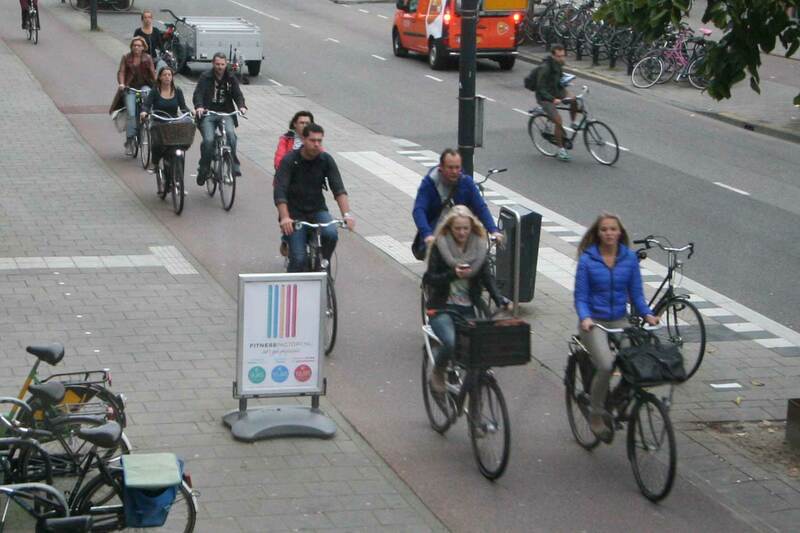 The stretch identified is especially problematic for cycling. 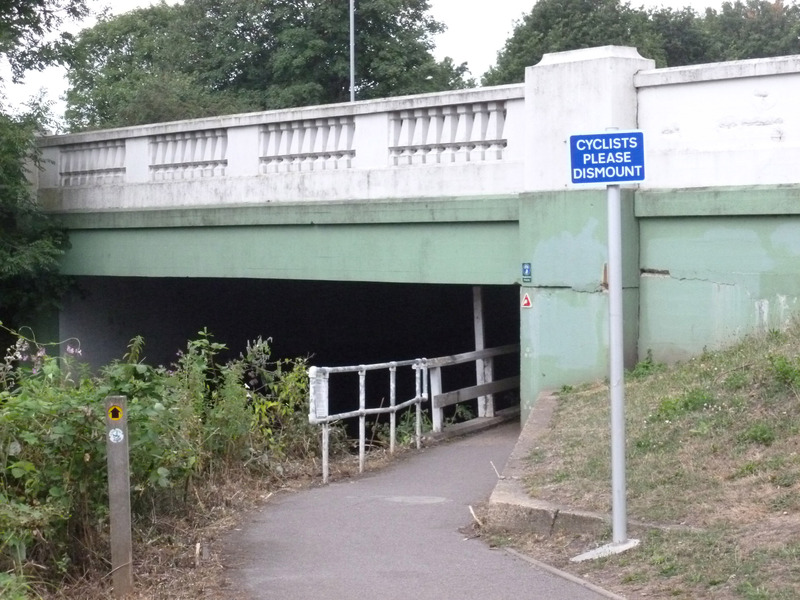 We hear regularly of Police Liaison Groups fielding complaints about cycling on the north side of the A316 between Richmond Circus and Manor Circus. And yes, cycling along here is not allowed. Yet people continue to do so. And why? Because this is not an easy road to cross, with just two controlled crossings throughout this entire section, and traffic routinely passing through at more than the 30mph limit. In terms of relative risk and actual danger, a check of the road statistics for this section indicate pretty clearly from whom pedestrians are at risk along these roads, and it isn’t someone on a bicycle. 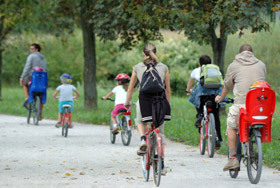 More and more people are using this facility, so it’s to be hoped that something’s going to happen soon – if we win the mini-Holland bid (http://www.richmond.gov.uk/mini_holland_bid), then the A316 is going to get a very substantial upgrade that could address almost all of these concerns.